Norfolk Southern's executive F9s have been heavily rebuilt but still maintain that classic covered wagon look. The F9, was the last of EMD's standard "covered wagons." By 1954 railroads had begun to move beyond the cab-style locomotive and were moving to the new "road switcher" model in droves. But with its upgraded 567C prime mover, EMD felt there was enough of a market left to give the old "covered wagon" one more shot. Starting with the FT in 1939, the locomotive more responsible than any other for the elimination of steam locomotives, the growing line of F units found work on railroads all across North America in seemingly every type of service. The predecessor to the F9, the F7, sold nearly 4000 units between A and B models. Although the numerals increased with successive models, the F's were not sequential like the E series. The F originally stood for Fourteen hundred horsepower with the F3. By the time the F9 came along, power had increased to 1750. It is commonly assumed by model railroaders that the F stood for freight, and that the F units were the freight service counterparts to the six axle E passenger locomotives. The letters were based on horsepower as mentioned, and Fs were right at home in passenger service. An optional boiler supplied steam for passenger car heating. EMD also offered a larger locomotive strictly for passenger service, the FP9. Later, the F9 would grow even longer in specialized dual-mode service for the New Haven as the FL9. Although an F9 could handle many assignments by itself, they were typically operated in multiples through the use of MU cables. Operated in pairs with another "A" unit made reverse moves easier by not needing to turn the locomotives. For additional power at lower cost, EMD offered F9B or booster units. F9s commonly ran as sets of three, four or more locomotives on mainline trains. To avoid potential union requirements for crews on each unit, many railroads numbered their A and B locomotives as A-B-C-D sets or other combinations of letters to denote different units as part of one "locomotive." What the F9 wasn't well suited for, like its predecessors, was work which required frequent reverse moves or switching with crew members on the ground. Railroaders quickly found the narrow hoods of the new "road switchers" like Alco's RS-3 and EMD's own GP7 much easier to work with. Externally, the F9 was very similar to the F7. The only "significant" spotting difference was the addition of another set of louvers ahead of the forward-most porthole window on each side. Railroad-selected options like the steam generator, dynamic brakes and smaller details can also sometimes cause some confusion between various classes including the successive F9. EMD had already unveiled its GP7 and would soon release its second Geep, the GP9. The future of the locomotive was represented in these locomotives and the GP9 would go on to be EMD's best seller to date while the F9 sold fewer than 250 locomotives. Despite the low numbers, EMD found buyers in nearly 20 railroads. More F9B locomotives were sold than As as railroads mixed the newer units with existing fleets of F3 and F7 models or new FP9s. Several remain in operation today in museums and tourist railroads. 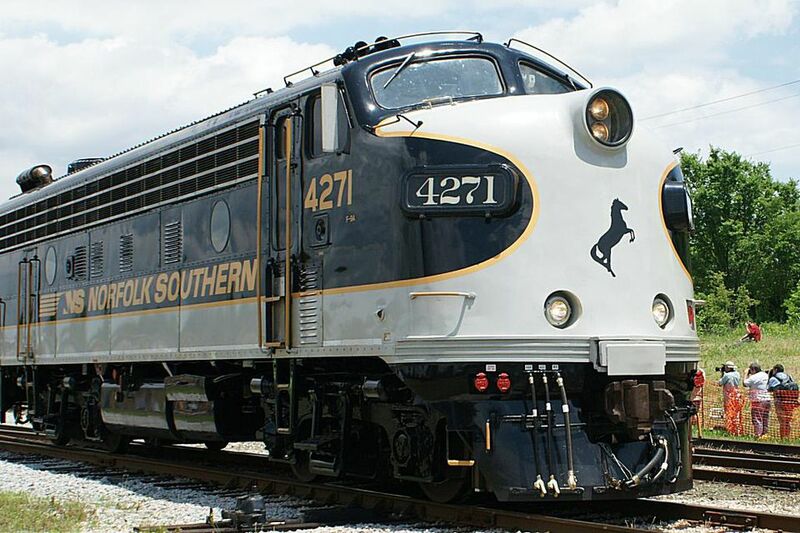 Norfolk Southern uses a pair of F9A locomotives for its executive trains, although these are heavily rebuilt and bare little more than an external resemblance to the originals. The F9 is one of the most common model train on the market. It's smooth lines and good looks give it a lot of appeal. And since so many roads had them, it is easy to find popular prototypes. They also make it relatively inexpensive to mold and decorate so this locomotive is a very popular choice for starter sets in many scales. The list of available models below includes all production that I can locate at this time. Models range from crude toy train set versions to highly detailed scale models. It is possible that additional models, especially brass imports, have been available in the past. The locomotives listed here have also been generally produced in limited production batches, so availability will vary. For scales where an F9 is not available, an F7 should make a good start for detailing or a substitute as is.